In this case it was “Take Me Out To The Ballgame” as the folks at Moog backed up their promise of ANOTHER DIMENSION with an intimate solo theremin performance. A sizable crowd enjoyed this breath of fresh air in a convention jam packed with high energy live gigs. Ed. : Moog Music has an incredible group of friends when it comes to Theremin players. 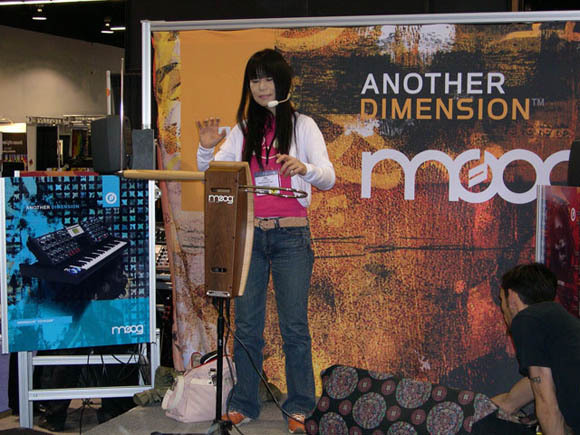 In this case, the artist is Japanese Theremin superstar ERI, who has the enviable domain theremin.org. She’s truly one of us, as she likes pulling up her webpage on her DS. I’m still excited about the new Moog Theremin kit. Need to pick one of those up.